Meet your neighbor Lucinda Baughman born in Fort Madison, Iowa but raised in Carman. Her parents are Lawrence and Lela (Huss) Worley of Carman who will have been married 49 years this September. Lucy attended school at Southern High School and graduated through the PASS program in 1999. 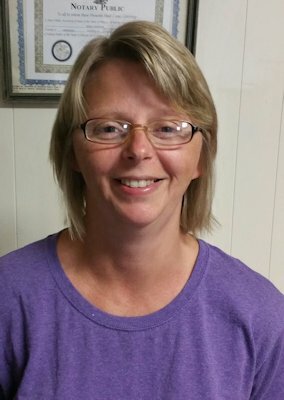 She has had her own business for 14 years, "Baughman's Cleaning" and cleans houses, offices, and churches. Previously, Lucy with the help of her husband, ran Baughman's Bait Shop until the flood pretty well ended that, she said. Lucy then worked at CSI Industries in Burlington, Iowa as a laborer, then a supervisor, and then a documentary controller, before moving into her cleaning business full time. "Lucy" lives with her husband J.R. (Harold Baughman) of 21 years in their home along the Carman-Stronghurst road. Her husband "J.R." works at Case-New Holland in Burlington, IA. The couple have two children, 20-year-old Jarid and 7 year old Jayden, a 2nd grader at West Central. Lucy's siblings are Leora Magner (husband Steve), Lorraine Benjamin (husband Kirby), and Leanne Forquer, (husband Dwayne). The girls grandparents are Lloyd and Almeda Huss and Albert and Goldie Worley. Lucy enjoys crafts, spending time with family and friends, and swimming in their backyard pool. She loves to camp and boating on the Mississippi River with family. Lucy says she enjoys cleaning and is woking to build her business. She says to give her a call at 309.337.9372 if you need someone to clean. Lucy's motto for life is to "enjoy life while you can."